The number and popularity of novels that have overtly reconfigured aspects of classic American texts suggests a curious trend for both readers and writers, an impulse to retell and reread books that have come to define American culture. This book argues that by revising canonical American literature, contemporary American writers are (re)writing an American myth of origins, creating one that corresponds to the contemporary writer’s understanding of self and society. 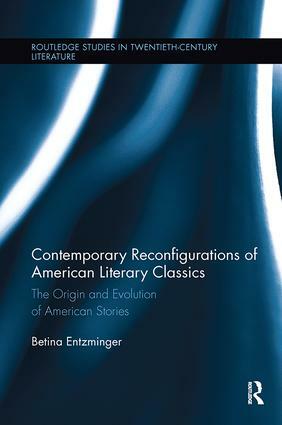 Informed by cognitive psychology, evolutionary literary criticism, and poststructuralism, Entzminger reads texts by canonical authors Poe, Hawthorne, Melville, Alcott, Twain, Chopin, and Faulkner, and by the contemporary writers that respond to them. In highlighting the construction and cognitive function of narrative in their own and in their antecedent texts, contemporary writers highlight the fact that such use of narrative is universal and essential to human beings. This book suggests that by revising the classic texts that compose our cultural narrative, contemporary writers mirror the way human individuals consistently revisit and refigure the past through language, via self-narration, in order to manage and understand experience. Betina Entzminger is Associate Professor of English at Bloomsburg University of Pennsylvania, US. From Joyce to Rushdie, Modernism to Food Writing, Routledge Studies in Twentieth Century Literature looks at both the literature and culture of the 20th century. This series is our home for cutting-edge, upper-level scholarly studies and edited collections. Considering literature alongside religion, popular culture, race, gender, ecology, travel, class, space, and other subjects, titles are characterized by dynamic interventions into established subjects and innovative studies on emerging topics.